Every year it seems electrical generators become quieter, more reliable and more fuel-efficient. But the best news of all is that electrical generators for boats are small enough so that even mid-20-footers can have ample electricity for powering air conditioning, refrigeration and a water heater. The added comfort is like the difference between camping out and staying in a plush resort. Both gasoline and diesel fueled GenSets are available. On one side of the balance sheet gas GenSets cost less initially but burn more fuel per hour. 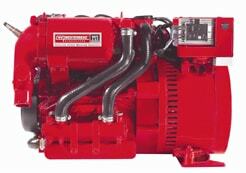 Diesel GenSets are more economical to operate but cost more money up front. In a best case scenario a GenSetwould burn the same fuel as the main propulsion. For example to accommodate a diesel generator in a gas-powered boat all that's required is the addition of a five- to 10-gallon auxiliary tank. So how many kilowatts (kW) might your boat need? Obviously the exact number of kilowatts a boat requires depends on the current draw of the creature comforts. A GenSet rated 3.0 kW (kilowatts) is sufficient to operate a 5,000-BTU air conditioner and refrigerator. A slightly larger 5.0 kW can power either a single, 16,000-BTU air conditioner, or a pair of 8,000-Btu units. With these basics in mind here?s a brief overview of what?s available. The world's smallest gasoline-fueled GenSet is the Westerbeke MPV3, a 25-amp power plant (3 kW). That's enough amperage to run a modest-size air conditioner or refrigerator. Weighing 165 pounds, the MPV3 is small enough to fit into a very tight space. Another tantalizing possibility is Westerbeke's Safe-CO line of gas generators that eliminate more than 99 percent of this deadly gas (CO). By way of sophisticated electronic fuel injection, the Safe-CO series of GenSets nearly eliminate the killer fumes. The sophisticated electronic fuel injection also boasts miserly fuel consumption. Another plus, electrical output features a utility-grade sine wave for powering personal computers and VCRs. Weight is a mere 165 pounds. Kohler's single-cylinder, 4.0-kW diesel generator weighs212 pounds. Water-cooled, it can be equipped with an optional remote-start. Voltage regulation is held to plus or minus five percent. Fuel filter, oil filter and the seawater pump impeller can be serviced from the same side. A bigger, slightly more capable 5.0 kW, is founded upon a three-cylinder motor and weighs just 10 pounds more. Kohler also offers gas generators with the same electrical output. Weight is about 100 pounds less than the diesel counterparts. Onan's compact units are dubbed electronic Quiet Diesels, or e-QD, for short. On board digital electronic controls boast extensive diagnostics and rock-solid voltage control. The smallest is a 4.0-kW model weighing 350 pounds. e-QD 4.0 purrs like a contented kitten thanks to its sound enclosure that keeps noise isolated locked in the vault. Kohler also offers the e-QG series, gasoline-fueled small GenSets with all the aforementioned features and benefits including digital electronics and subdued voice print. Next Generation's ultra-compact 3.5-kW unit features 7-hp, one-cylinder, electronic fuel-injected gas motor that lays flat for a low-to-the keel profile for easier installation in tight spaces. The smaller dimensions cut weight to 160 pounds. A remote start panel features an hour meter to better keep track of oil change intervals. Oil pressure and water temperature safety shutdown circuits prevent damage to the unit in the unlikely event something should ever go amiss. For peace and quiet, even with air conditioning running, a four-point isolation mounting system minimizes vibration. Next Generation Power GenSets offer a new sound enclosure that dramatically quiets the company's already subdued 5.5-kW GenSet. Sound levels read as low as 60 decibels. Similar in design is Next Generation?s slightly larger 5.0-kW diesel set. It, too, boasts a low pro-file and light weight (230 pounds). So finally, how many kilowatts (kW) might your boat need?